Tuesday nights we head over to the library for a free show. They always bring in really entertaining acts. This week was Safari Greg. 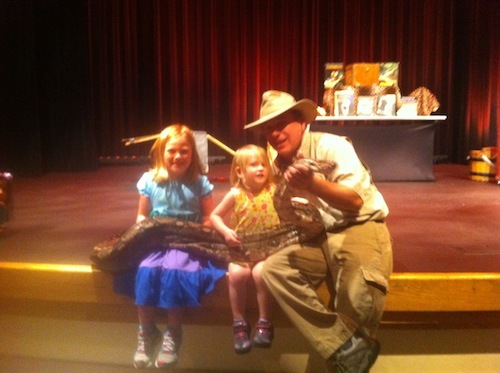 He brought a Milk Snake, a Cayman, a Boa Constrictor and a Milk Snake to show. He also does a bit of magic. The room erupted with screams when that funny helmet lamp lit up no matter how many times he blew it out. At the end of the show, he let everyone sit with the Boa Constrictor. We waited for over half an hour, but it was worth it. I’m about to upgrade my phone just for the better camera.